The pair EUR/USD has been trading within a range of 1.3800-1.3720 for two weeks. Investors do not risk entering the market, waiting for the results of FOMC meeting. The regulator is expected to announce the curtailment of QE3 program, although members of FRS can’t find a consensus. Those who are pro-curtailment underline economic recovery and unemployment decrease to 7%. Their opponents remind about inflation growth and propose to prolong soft monetary policy. The pair won’t probably be volatile today. However publication of Economic Sentiment indices of Germany and Eurozone may give pair some impetus. The indices will most probably grow and make EUR/USD reach upper border of the channel at 1.3800. On the four-hour chart technical indicators confirm the possibility of the growth. Bollinger bands are moving sideways; the price chart has pulled back off the middle MA and is going up. MACD histogram is in positive zone and can soon cross the signal line from below. Stochastic lines has crossed and formed a signal to buy. 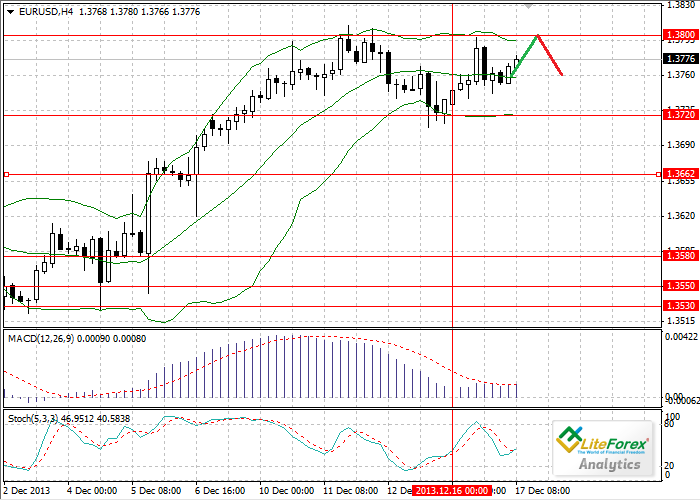 It is recommended to open long trades at current price with targets at 1.3800. Pending sell orders can be placed at the same level with take-profits around 1.3760.